How to watch the only supermoon of 2017. It’s happening this weekend! Finally, something good. A supermoon shining over the Russian city of Vladivostok on Dec. 14. A full moon might come around once every 30 days, but a supermoon—when the full moon appears bigger and brighter than ever before—is a much rarer celestial spectacle. Like Thanksgiving dinner or resolutions to give up social media, supermoons only happen once, maybe twice a year. This year will see just one supermoon, and you’ll need to play your cards right this weekend for a chance to see it. A supermoon is essentially a collision of two astronomic phenomena: the perigee and the syzygy. The moon’s distance from the Earth naturally fluctuates as it orbits. When it gets to its shortest distance, that’s called the perigee—it’s about 225,000 thousand miles away and 16,500 miles closer than usual. As the moon orbits around the sun and Earth orbits the sun, phases of the moon are intermittently created. The alignment between Earth, moon, and sun that creates full moons (or new moons) is called syzygy. When the perigee occurs at the same time as a full moon, we get a “perigee syzygy”—colloquially known as a supermoon. When this happens, the moon appears up to 15 percent bigger and 30 percent brighter than it usually does. The last supermooon to hit the night skies was over a year ago, and it was closer to Earth than it’s been since 1948. It won’t be that close until 2034—this year’s supermoon, occurring on Dec. 3, which is Sunday night, will be a bit more muted: only about 7 percent bigger and 16 percent brighter. Depending on how much of an aficionado you are of lunar events, you might not really be that interested. 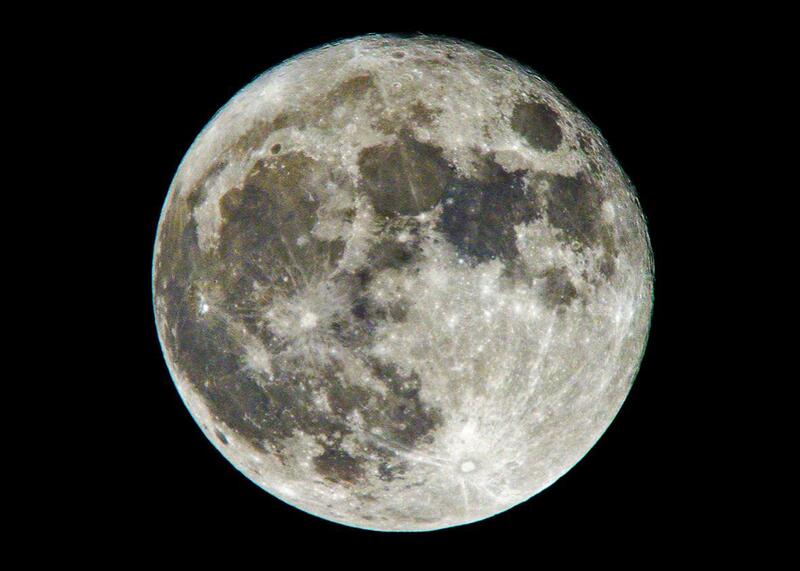 Truth be told, many people can’t normally differentiate a supermoon from a run-of-the-mill full moon. If you want to really soak in the supermoon this year, you’re going to have to watch it the right way: like a space nerd. First thing’s first: Look for the moon on the horizon right after moonrise (you can find local moonrise times here). It will appear bigger and brighter thanks to the “moon illusion” effect that makes the moon larger by the horizon than it does higher in the sky. Exactly why this happens is still unclear among scientists, but for the purposes of the supermoon, just go with it. Next: Bring a pair of binoculars, or even a small telescope, for some extra magnification. You’ll want to soak in as much of the supermoon as possible, and you’ll do yourself a favor by using this opportunity to gaze at incredibly fine details on the lunar surface. If you miss the moonrise, you should still take an opportunity to look at the moon sometime in the night. You’ll also have an encore chance at a peak viewing moment at 3:45 a.m. ET on Dec. 4, according to NPR. Yes, we’re trudging headfirst into the winter season, which means it’ll be cold out. If you’re a giant baby and don’t want to go outside, you can pull up a livestream of the Virtual Telescope as it watches the moon rise over Rome. Normally this is the part where I might tell you how to find the moon using a night sky smartphone app, but if you already have problems spotting the moon, you might just want to stay inside and forget about the supermoon entirely. For the rest of you, happy viewing!